There’s no getting around it … the responsibility sits squarely on your shoulders. You must, without delay, furnish temporary traffic control to a busy area. The questions multiply. So you ponder the possibilities. What’s the best place to start? Who’s a reliable resource? The list of questions could reach the moon. Clearly, when all is said and done, your chosen firm must boast impeccable credentials. Roadway Construction Service (RCS) easily qualifies for that distinction. When maintenance of traffic is a top priority, we consistently hit it out of the park. But don’t just rely on our words. Numerous clients will back up this claim enthusiastically. What accounts for our stellar performance record in the field of work zone traffic control? We could say years of experience. Or mention proven know-how. Or supply many other equally excellent reasons. And all of it would be true. But at Roadway Construction Service, we prefer going even deeper than that. For us, success stems from an innate ability to organize effective solutions into a system of meticulously managed processes. This means that every aspect of temporary traffic control is carefully monitored and implemented by our ‘A’ team of experts. No question about it … they really know their stuff. Among our managed processes is the acquisition of encroachment permits. This crucial phase unfolds long before the first traffic barrier touches pavement. Here, the value of expert personnel is clear. This native expertise comes into play on two levels. First, it’s demonstrated by our team’s in-depth knowledge of municipal codes and regulations – and how to achieve compliance by identifying properly-chosen solutions. The second level of expertise strikes a more personal chord. That’s because through years of experience, our permitting team has developed important relationships with many municipal decision-makers. Expectations are known and therefore satisfied well in advance. Our team dashes through red tape like Olympic champs. The combined power of in-depth knowledge and long-standing relationships eliminates delays, quickens response rates, and ultimately lays the groundwork for greatly expedited encroachment permits. Effective managed processes also play a major role out of the field. Lane closures, for example, depend on managerial expertise. Leading the list of considerations is the deployment of traffic barriers. Given the broad spectrum of possible circumstances and conditions, a wide range of traffic barricades may be evaluated before selections are made. 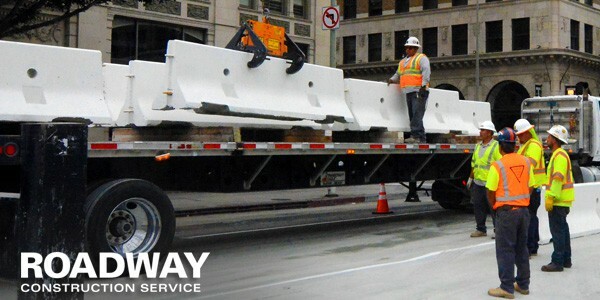 Depending on the area covered and other factors, Roadway Construction Service will choose and deploy any number of traffic barriers. Lane closures often require a variety of these barricades (or traffic guards, as they’re sometimes called). The possibilities include everything from compact cones to massive k-rail (a.k.a. Jersey barrier). But barricades alone won’t do the job. Barricade power must be reinforced by the expertise of traffic control flaggers. Working in sync, these two components define the ultimate balancing act. While barriers communicate with boundaries, flaggers do the same with flag signals and gestures. To round out this one-two punch of roadside barriers and flaggers, Roadway Construction deploys carefully-chosen traffic signs at critical locations. 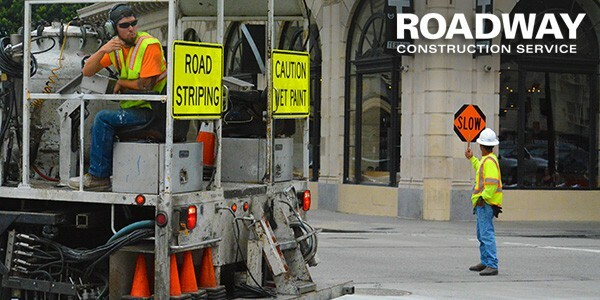 Powered by a coordinated, tightly-managed configuration of barricades, flaggers, and traffic signs, Roadway Construction Service has developed a unique system of temporary traffic maintenance services. If traffic control is your top priority, count on us for top solutions.